Hiratsuka Unichi 平塚運一 (1895-1997), born in Matsue in Honshū, was one of the prominent leaders of the sosaku hanga movement in 20th Century Japan. Hiratsuka was the best–trained wood carver in the sosaku hanga movement. From 1928 onwards, he taught the renowned sosaku hanga artist Munakata Shiko (1903-1975) wood carving. 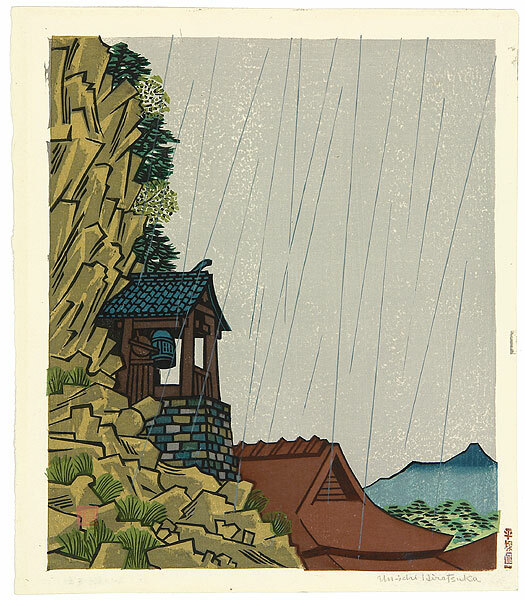 Between 1935 and 1944 Hiratsuka taught the first blockprinting course at the Tokyo School of Fine Arts. He moved to Washington D.C. in 1962, and spent thirty three years in the [[United States]. While living in Washington DC, he was commissioned by three standing Presidents to carve woodblock prints of National Landmarks, which included The Lincoln Memorial, The Washington Monument and The Library of Congress which are in the collections of The National Gallery and Freer Gallery today. He ultimately returned to Japan in 1994. Hiratsuka was awarded the Order of Cultural Merit by the Japanese government in 1970. In 1991, the Hiratsuka Unichi Print Museum was opened in Suzaka, Nagano Prefecture. Hiratsuka's father was a shrine carpenter, and his grandfather was an architect who designed houses and temples. Therefore the artist was introduced to wood-working and architecture early in his life. 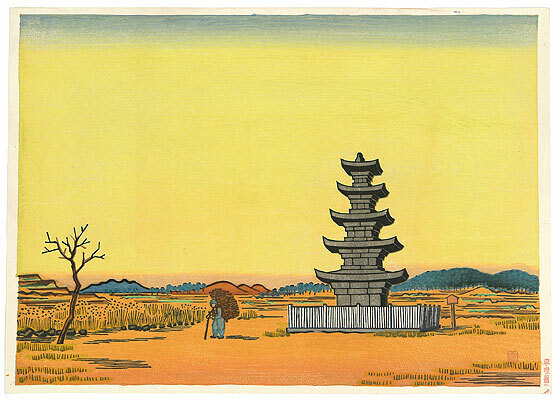 Many of his woodblock prints are of temples, bridges, in addition to landscapes he captured in his travels throughout Japan, Korea, and the United States. Hiratsuka was also a serious collector of old Buddhist prints, and his works are influenced by his exposure to Buddhist figures. He also had an extensive collection of roof tiles, Judaica and Bibles in every language, and when he was not practicing his art, spent hours reading. Hiratsuka's techniques and styles evolved over his lifetime. Pre-WW2 blocks included many color woodblock prints and engravings, while after WW2, he worked almost exclusively on black-and-white prints. His most famous technique is called tsukibori ("poking strokes"). With a small square-end chisel (aisuki), Hiratsuka rocked the blade side to side in short strokes, producing rough and jagged edges.